The Wayne County Veterans Memorial Park in Richmond, Indiana, would like to hear from CW2 D.W. Bragg, 1st Lt. G.M. 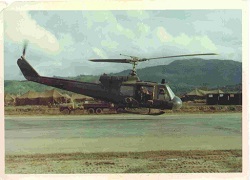 Bass and other pilots and crew members who served in Vietnam on a particular Huey helicopter: No. 66-16569, which was known as “The Silver Fox.” It flew out of An Son Air Field in II Corps (Binh Dinh Province), not far from Qui Nhon.